In our new building, we have this beautiful chapel on the 4th floor. It has been a joy for the staff to dream about how this space will be utilized. It will likely serve a number of purposes, but one of the first things we have launched is our “Every Other Friday Afternoon Worship Service”. Sandy Gross, our “Life Skills Program Director”, had an idea to create a regular time in our schedule for worship, devotional time, prayer and testimony. This chapel service is designed for our clients, but staff, volunteers and supporters are welcome to drop in on the 1st and 3rd Fridays of the month at 1-2pm. Our current format involves what we call our “Song of the Day”. We choose a song that we think will speak to our young women. We play it, talk about the message of the lyrics, and then we do our best to sing it together. We also have a segment called “From Story to Skit”. Our clients love interactive lessons, so we select a story from the Gospels, talk about it—then gather volunteers from the group to act out the story. I have to admit that we have some awesome actresses in our midst. Since the stories of Scripture are unfamiliar to some of our girls, this is a great way to help etch them into their memories. We recently reenacted the story of the woman who cried tears on Jesus’ feet, and wiped them with her hair. 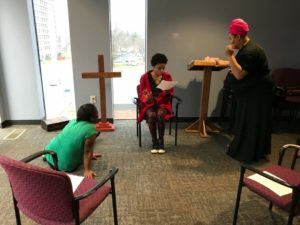 Our client who played the part of the woman was so moved by her role in the story that she actually did break down into tears, sensing that Christ was so merciful to her in the midst of her own past. We also have a time called “What is God Teaching You”, where clients get the opportunity to share testimonies about their personal journey. We typically close with both teaching and participation in prayer. This most recent chapel service we all shared three written prayer concerns, and paired up clients and staff to pray for each other for the two weeks in between our services. It is a great start because it feels like worship, it feels like family, and the joy and teamwork we have experienced is bringing us closer to God and to one another.